I can’t even remember the last time I did a ‘favourites’ video. Things are so different to what they used to be before I had kids. I no longer have to fill the empty hours of my day with looking for new products and things to try. I have no empty hours in my day. This is a fact. Gone were the days where I had enough new things to talk about for 10-15 minutes on camera every month! Nowadays, stick to pretty much what I know on a daily basis, and occasionally, when I’m feeling brave, I’ll try something new. That counts for makeup, skincare and baby things. 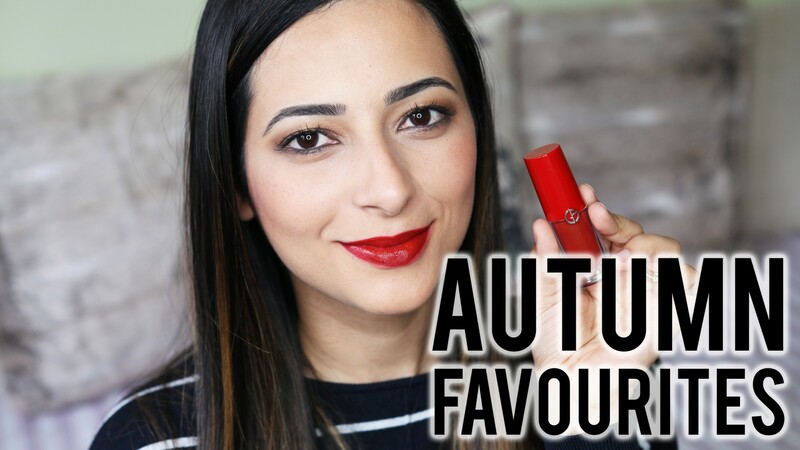 So I decided to do this favourites round-up of recently, and call it ‘Autumn Favourites‘. One, because it’s Autumn, so it’s appropriate. Two, because there are a lot of weather-appropriate things for this season. And three, because I didn’t want a random name like ‘recent favourites’. Just know that some of these things I have been loving for months! Four, five, maybe even six months. I told you I’ve changed – I’m so much more loyal to my ‘things’ now. Boots & Tesco Haul: John Frieda, Rimmel, Bourjois and more! Red lipstick looks lovely on you!